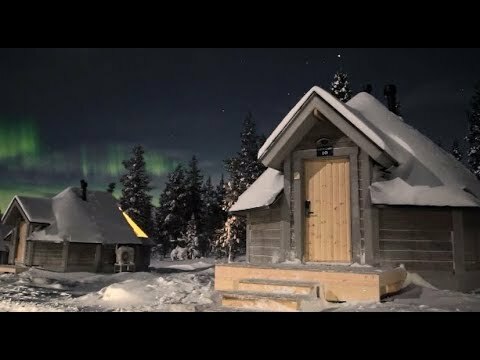 Staying in an Aurora Cabin was beyond my expectations and something I will never forget. I arrived just as the sun was setting and the sky was a magnificent combination of pink and orange, yet it was still only the afternoon. 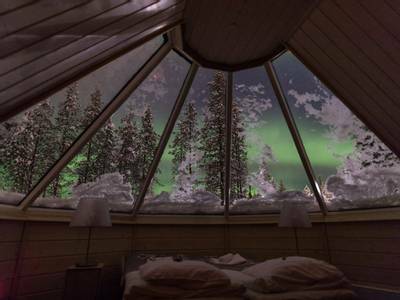 I hadn’t really expected anything from that first evening, but not long after settling into the cosy bed, I noticed flickers of green through the glass roof of the cabin. I immediately went outside and was treated to a fabulous display of ethereal colour. An experience which will stay with me for a long time! 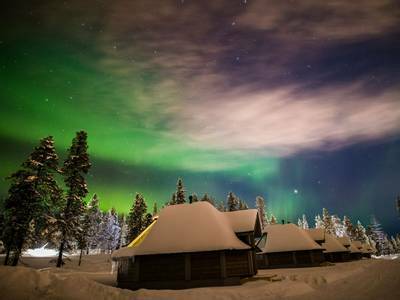 Situated in Saariselkä, Finland, the Northern Lights Village puts you in prime Aurora viewing territory. 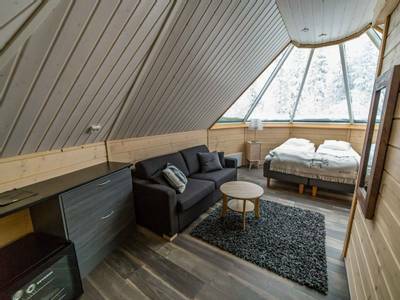 This makes your 4-night stay in a glass-roofed Aurora Cabin even more exciting. 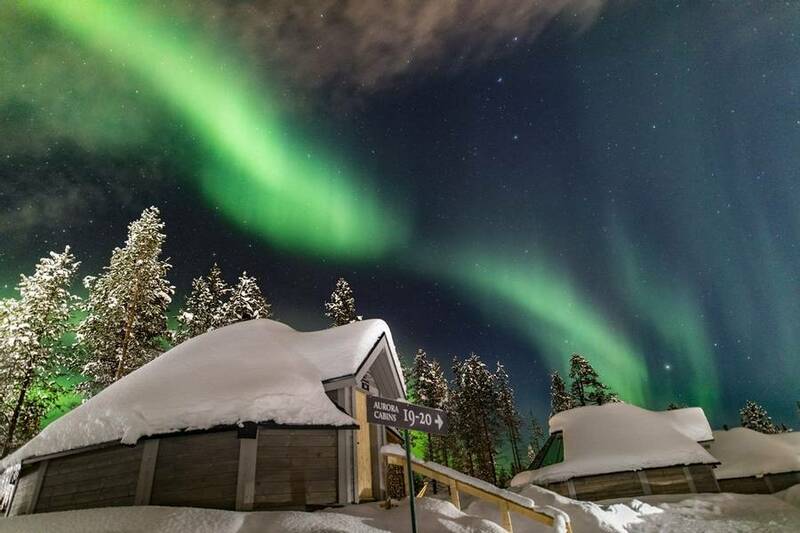 What’s more, you’ll go on dedicated Northern Lights hunts and enjoy unforgettable daytime experiences such as dog-sledding. 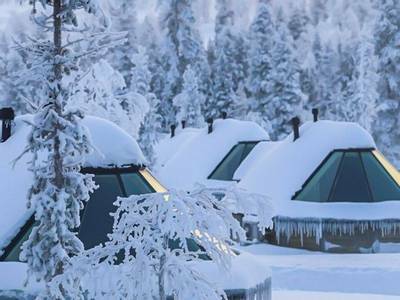 Saariselkä is ideally located at the edge of a winter wilderness in the far north of Finland. 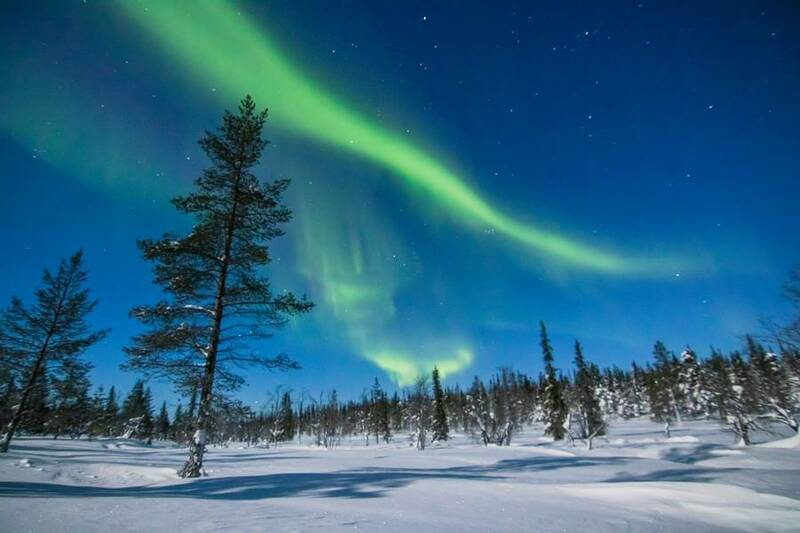 It is approximately 250km above the Arctic Circle which means that it is a prime location for Aurora hunters. 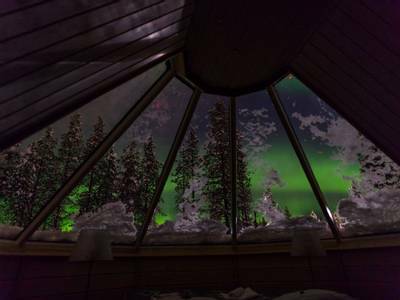 The Northern Lights Village is separated from the lights of the town by thick forest and it is the only destination we feature in which you can spend the entirety of your holiday in a glass-roofed Aurora Cabin. Although the fresh Arctic air can be quite tiring, you will find yourself fighting to stay awake, attempting to seek out flickers of green in the sky above your bed. Perhaps one of the most sought-after souvenirs from any Aurora holiday is a photograph of the lights. An initial Aurora workshop will reveal the secrets necessary for capturing the lights, introducing the settings required for producing the best pictures. 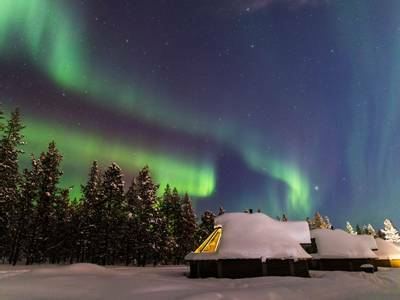 You’ll then set out to hunt the lights on three nights, enjoying time at an Aurora Camp, travelling in a snowmobile-pulled sleigh on one evening and then driving snowmobiles on another. 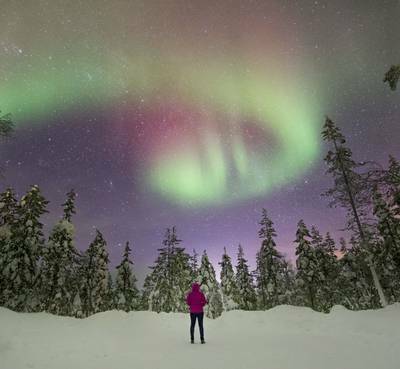 In addition to hunting the Northern Lights, this holiday includes some of our favourite winter activities. 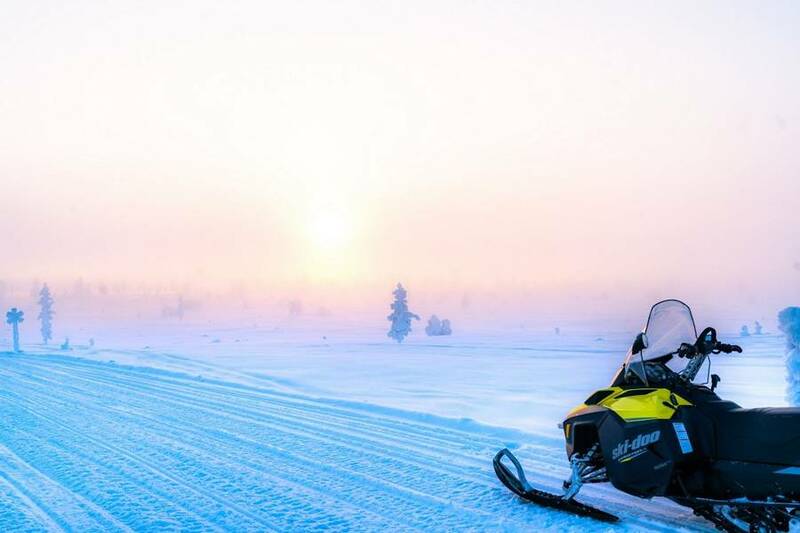 A session combining snowmobiling and ice fishing ensures that you are able to enjoy a popular Finnish pastime whilst also experiencing the thrill of snowmobiling. 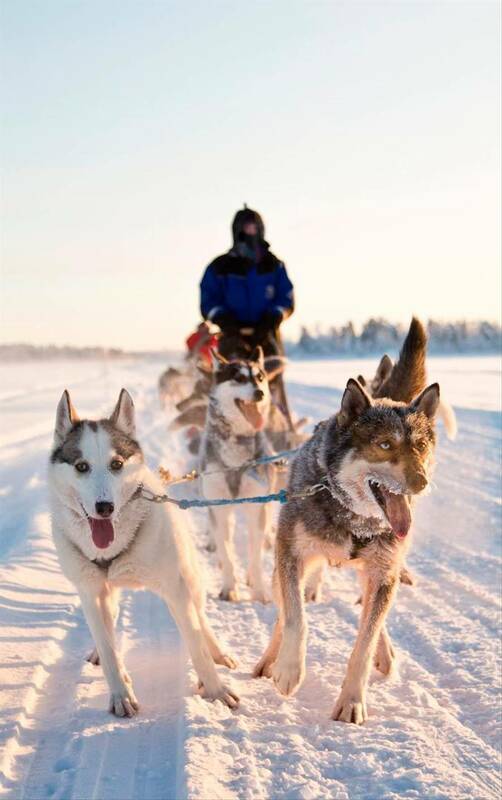 You will also enjoy a 10 km husky safari. When not planning on how to sneak a husky home, you shall take to the trails for an unforgettable adventure with the dogs. 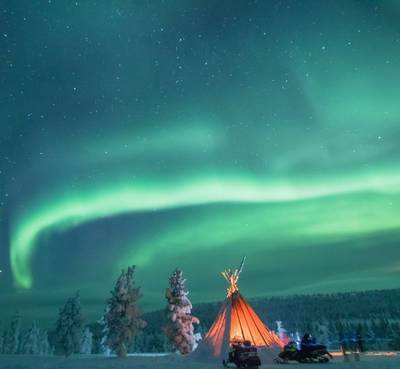 Living this far north of the Arctic Circle is extremely challenging given the harsh winters, but the indigenous Sámi people have thrived here for generations, many as reindeer herders. 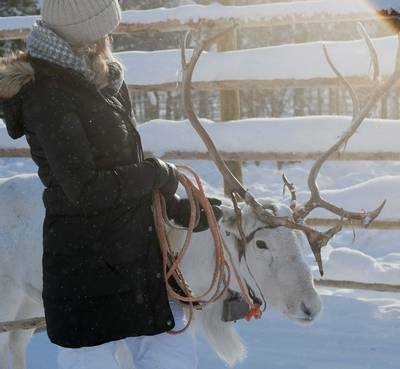 This holiday provides an insight into their culture, including a visit to the reindeer paddock for a sleigh-ride. 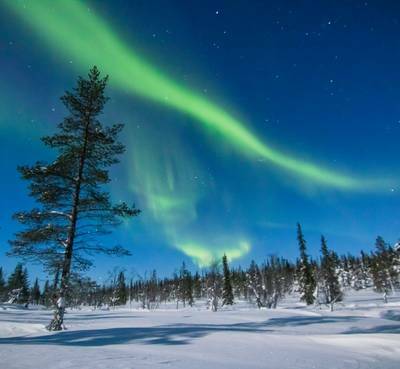 This four-night itinerary is designed to maximise your chances of seeing the Northern Lights, whilst also introducing you to the fascinating culture north of the Arctic Circle. 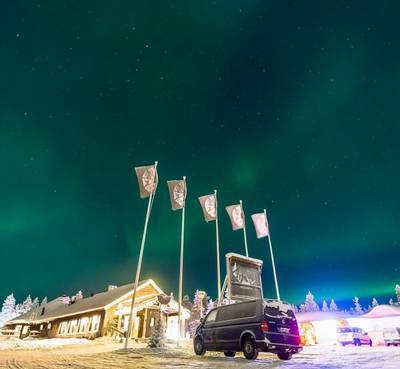 Following your arrival at Ivalo Airport, you will make the short transfer to the Northern Lights Village and your Aurora accommodation. Viewing the Northern Lights is a spectacular experience, but capturing them on camera is no easy task. This evening’s Aurora photography workshop will help prepare you as you join a local guide who has many years of knowledge and experience. 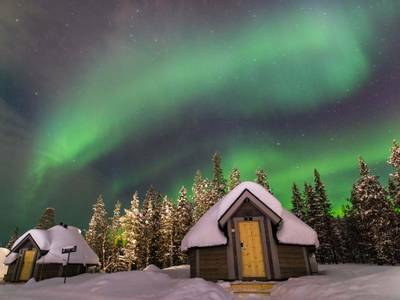 The workshop will reveal all the secrets necessary to capture the Aurora through a lens. Should the lights appear in the coming days, you can then proudly show off your photos. If you do not have a camera capable of capturing the lights, then they are available to hire locally. After breakfast, you will meet a local reindeer herder before enjoying a tour which will explore this age-old way of life. Reindeer are synonymous with the Arctic and it is fascinating to learn how they manage to survive in these harsh winter conditions. 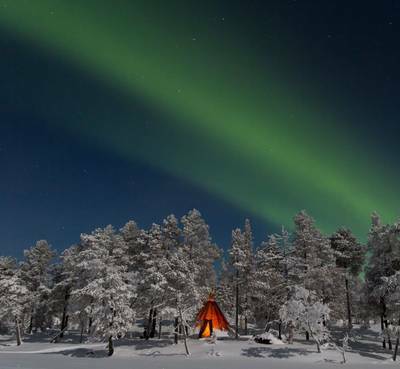 In addition, you will gain insight into Sámi culture which has thrived north of the Arctic Circle for generations. Reindeer have played a key role in the Sámi’s ability to adapt and asking a Sámi how many reindeer he has, is like asking how much money somebody earns. You will explore the paddock at the Northern Lights Village before meeting the reindeer and having the opportunity to feed them. Your guide will introduce you to the various aspects of reindeer herding. Following this, you will enjoy a short ride on a reindeer-pulled sleigh. This was once a traditional method of transport, before the introduction of snowmobiles, and it can feel quite ‘Narnia-esque’ as you venture into the snow-covered forest. Lunch will be served at the Northern Lights Village and with this included, the activity will last between three to four hours. 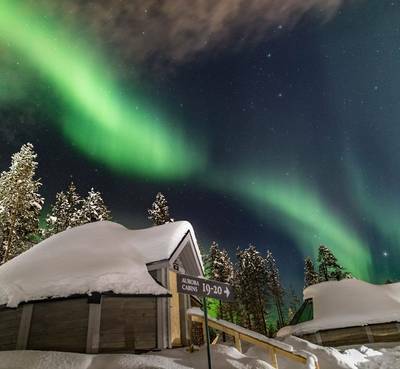 During the evening, you will enjoy dinner in the restaurant, before embarking on your first Northern Lights hunt by a snowmobile-pulled heated sled. You’ll break to enjoy hot drinks by a fire and listen to local stories told by your guide on this 3-hour tour as you eagerly await a potential display. The anticipation felt during the hunt is part of the enjoyment, and with a little luck, the conditions will be promising for you tonight. Following breakfast, you will join your local guide and enjoy a combination of two popular winter activities. 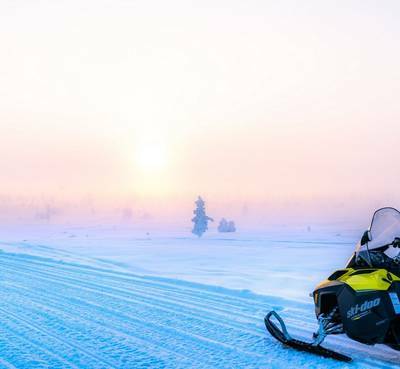 The four-hour tour will begin with a snowmobile safari as you enter the forest and breeze past breathtaking scenery towards a nearby frozen lake. Once at the lake, your guide will assist as you drill a hole into the ice, bait the hook and attempt to catch perch or whitefish. Ice fishing is very popular with the locals and, whilst it may seem a sedate activity, that all changes if you land a catch! Your guide will build a fire and you will enjoy lunch, which hopefully will include some fresh fish. Full driving instructions will be provided and you will travel two people per snowmobile (you must have a full driving licence and be over the age of 18 to drive the snowmobile). 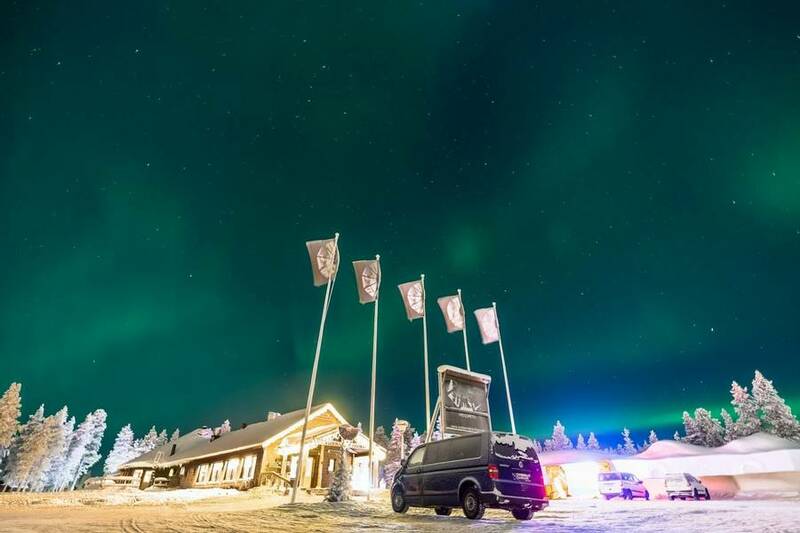 During the evening, you will enjoy dinner in the restaurant before venturing out for another dedicated Aurora hunt. 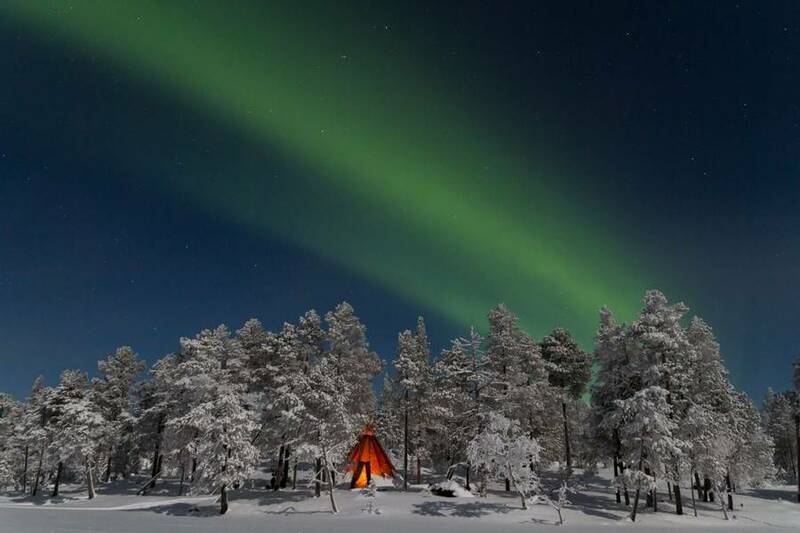 This three-hour tour will take place in the comfort of a bus and includes a visit to Lake Inari. 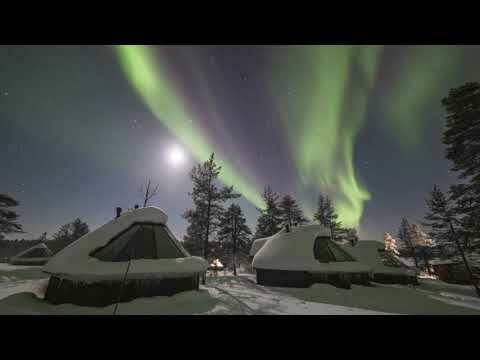 The Aurora Camp is located on the lakeshore and has a stunning outlook across the frozen ice. 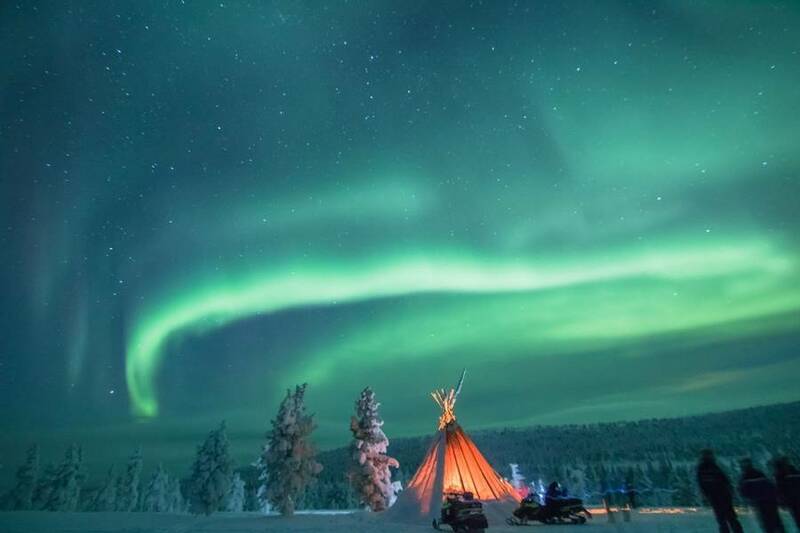 You will enjoy drinks and snacks around a cosy campfire and should the lights appear, you can grab a reindeer hide, lie down in the snow and enjoy a captivating display. 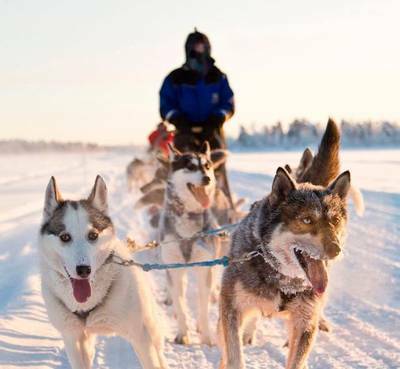 Perhaps the most eagerly anticipated daytime activity will be your husky safari. Obviously, the dogs themselves are a major attraction and on arrival, you will immediately notice their excitement. They simply love pulling the sled and once attached they will no doubt be jumping up and down in anticipation. The moment the safari begins, however, they become focused and the only sound is that of pattering paws on the snow. After a short drive, you will meet the dogs and explore the wilderness during this 10 km safari. The terrain is diverse and you will navigate the rugged fells and through the forest. Hot drinks will be served during the activity. Full tuition on how to handle the sleigh will be given by your expert guide beforehand and you will travel two people per sled. The tour lasts for approximately two and a half hours including transfers. If you would like to upgrade to a longer safari then this can be arranged, please see the ‘Personalise’ section of the holiday page for details. Following the tour, you can enjoy lunch in the restaurant before having the remainder of the afternoon at your leisure. 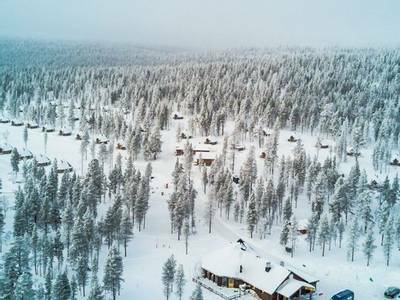 The ski town of Saariselkä is within walking distance and there is a variety of shops, cafés and restaurants here as well as a range of downhill ski slopes to enjoy. Tonight it is time for your final activity. There is something quite thrilling about the sound of the engine as you start up your snowmobile on a cold winter’s night. Your headlight points towards the dark forest and then the chase begins. You will enter the woods and make your way towards the top of the fells, searching for any glimmers of colour in the night sky. Once at the top, your guide will light a fire and you will enjoy hot drinks amidst the wilderness. 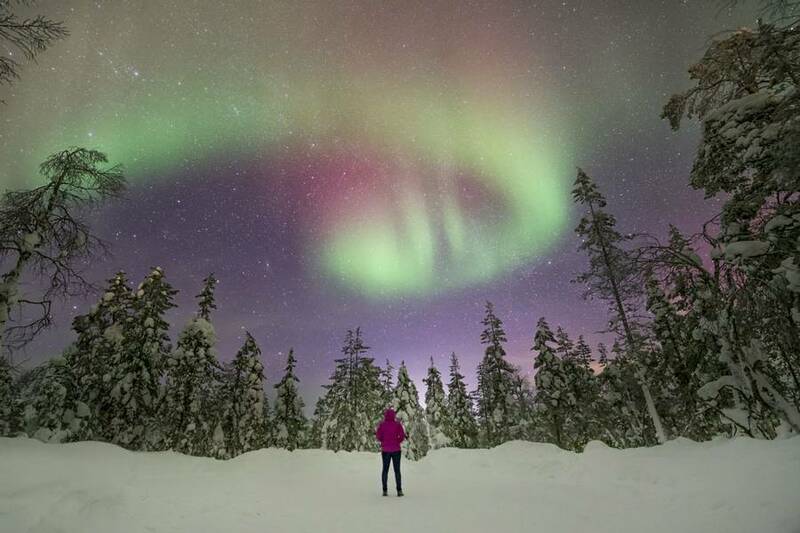 If the lights should appear during this three-hour tour, your local guide is always on hand to assist with photography settings and capturing the Aurora successfully. Full driving instructions will be provided and you will travel two people per snowmobile (you must have a full driving licence and be over the age of 18 to drive the snowmobile). Following breakfast, it will be time to leave the Northern Lights Village behind. If you are departing on an early flight then a boxed breakfast will be provided for you to take with you. You will be transferred back to Ivalo Airport for your return flights home. A husky safari is one of those experiences you are likely to remember for the rest of your life. 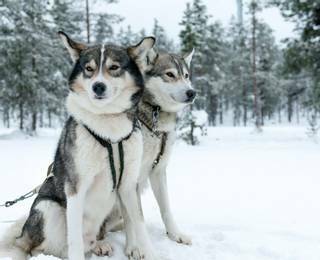 Once the dogs are running and the sleigh enters the wilderness surrounding Saariselkä, all else is forgotten. 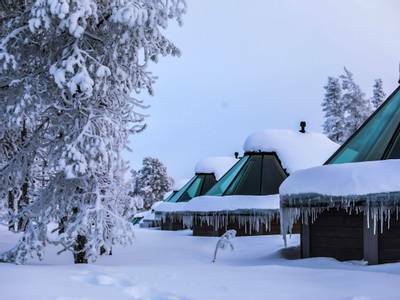 It is one of those activities that you don’t want to end and extending your safari will prolong the adventure and allow you to venture further out into the snow-covered landscapes. The dogs will be more than willing to accommodate you. You will ride 2 people per sled. 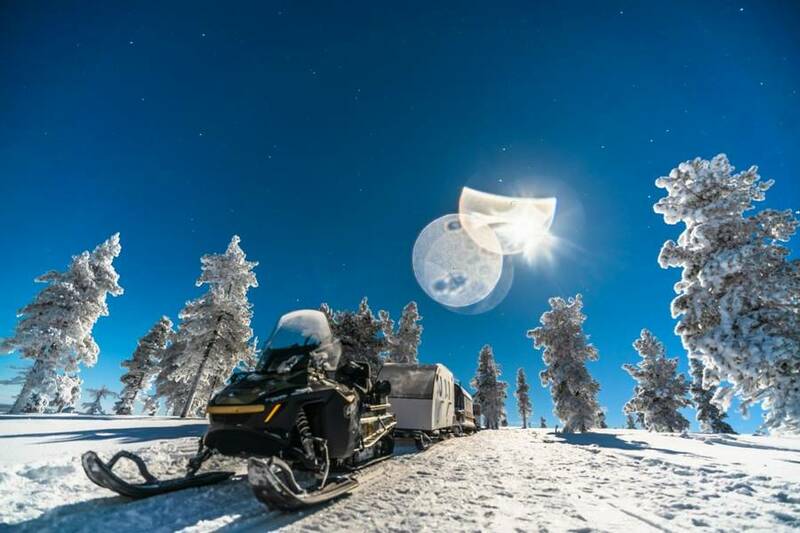 The single supplement is based on having your own cabin but sharing a snowmobile, husky sled and transfers. 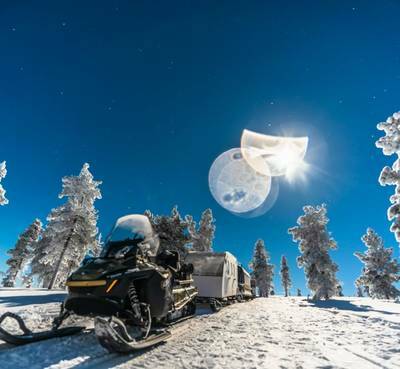 If you wish to upgrade and drive your own husky team and snowmobile safari please ask our Travel Experts for a quotation. The whole experience was amazing from booking to coming home. Read more younger than a lot of the other guests. Read more and information prior to the trip was excellent. The Northern Lights Village guides were all excellent. We enjoyed the Aurora hunt by snowmobile and snowmobile safaris, we both loved driving/riding the snowmobiles. The Northern Lights Village guides were fabulous and made the trips very enjoyable. A really great holiday thanks. Food and accommodation excellent and staff very helpful.